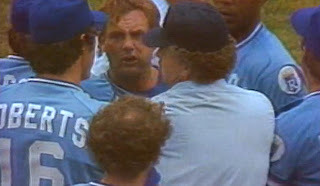 If you were at Yankee Stadium thirty years ago today, you were there to witness George Brett of the Kansas City Royals getting tossed out of the game during the ninth inning for the infamous pine tar incident. Future Hall of Fame slugger Brett was well known for the amount pine tar he used on his bat to improve his grip. At the top of the ninth inning, Brett came to the plate with a runner on first base. Pitcher Goose Gossage, who'd been brought in to close the game, tossed one right across the plate, and Brett knocked it into the seats, putting the Royals into a 5-4 lead. Immediately, Yankees manager Billy Martin came out of the dugout to complain. He showed Brett's bat to the umpires and reminded them that Major League Baseball's rules forbid pine tar more than 18 inches from the handle of the bat. Using home plate as a ruler (it's 17 inches wide), they determined the bat was in violation. Brett was called out and the game was won by the Yankees. Brett immediately charged from the dugout in protest and had to be restrained. The Royals quickly confiscated the bat to use as evidence in a formal protest, which they lodged with the American League. League president Lee McPhail ultimately agreed with the Royals--even if the bat was in violation, the rule had been designed to protect baseballs from being ruined by the tar, not because it gave batters an illegal edge. McPhail restored Brett's home run and ordered that the game be finished at a later date. The Yankees dragged their feet, hoping not to have the play the remaining out of the ninth inning, but on August 18, the game resumed. The Royals won, 5-4. Brett's bat was placed in the Hall of Fame in Cooperstown. You can watch the play-by-play of Brett's home run and the aftermath at Major League Baseball: http://wapc.mlb.com/play/?content_id=3180386#.